Happy Halloween to you all. No, I am not sharing a Halloween card with you today, as I don't celebrate it. I will however show you a pic of my daughter all dressed up in costume for her first Halloween party she's ever attended at the end of my post. Instead I have a Christmas card that I made yesterday during my workshop that I didn't have a chance to post. Being a Friday I was busy being Mum's taxi service for my daughter and her Basketball game on last night. This card was a CASE of my original Wisteria Wonderland card posted a few weeks ago (also posted in the group pic below). The cardstock is Night of Navy and Whisper White and inks used are Crumb Cake, Night of Navy and Marina mist. Snowflake embellishments, iced Rhinestones and Basic Rhinestones have been added. Here's the full view of my card today. These cards are quite quick to make and easy to replicate if you wanted to make a bunch of them. Today I'm sharing a Christmas card which I made in a hurry with my Sleigh Ride edgelits for a class sample last week. This one uses an Elegant Eggplant base and we made a Navy one in class which I've already posted. Besides Elegant Eggplant the cardstock used is Whisper White, Smoky Slate and Dazzling Diamonds Glimmer. The stamp set used was Jingle All the Way. Thanks so much for stopping by today. Have a great Thursday. I'm making Christmas Cards at the moment and decided to make another using this sketch as the basis and use some of my stash of retired papers. I can't even remember what this one was called. I combined it with the Wonderous Wreath stamp set and matching framelits. The cardstock I've used is Mossy Meadow, Old Olive, Soft Sky, Real Red and Whisper White and I've added a Gold foil doily and some gold cord to the wreath which was stamped with Mossy Meadow and Versamark inks and heat set with some embossing powder. I've used the Decorative Dots embossing folder on the Old Olive panel. Here is a closer look. I've used the Decorative Dots embossing folder on the Old Olive panel. If I'm ever in doubt with what to create for my cards I know I can always rely on my butterflies and I decided that I would use the Watercolor wonder set for this challenge combined with the matching butterfly framelits. I actually made two cards today with similar supplies. Come and take a look. The cardstock for both cards is Early Espresso for the base and Whisper White for the embossed background. I've also used the Gold Foil with the Greeting & Butterfly thinlits on these cards. The first one uses the Lovely Lace embossing folder. They were finished off with Blushing Bride ribbon and some Gold cord and pearls. The second card uses the Decorative Dots embossing folder. Here's a closer look at this butterfly as I did something a bit different with this one with the gold cord to create feelers. Here's another Christmas Card I made recently. This one was part of my Saturday Card Class and features the Happy Scenes Stamp set combined with the Hearth & Home window framelits. Come and have a look. I actually made this card in two colours and I'll feature the other one in a couple of days time. The cardstock I've used is Wisteria Wonder, Basic Gray and Whisper white with some Silver foil for the "Peace" greeting from the Christmas greetings thinlits. The trees have been stamped on some old designer paper from my stash and cut and layered with some Dazzling Diamonds glimmer paper to depict snow. I got this idea from my stamping sister Gaye from a card she showed me. The Basic Gray background has been embossed with a retired embossing folder called Beautifully Baroque. I love the vintage style of it and it makes this the gray look like wallpaper. The little bow comes from the Wonderful Wreath framelits set. How is your weekend going? I have been so busy making Christmas cards lately, Here is another one I made using the Wonderful Blessings single stamp when I had it out a couple of weeks ago plus a pics with another I already featured previously on my blog. I do love the colour combinations and how you can sponge them for different looks using the Resist technique. So the cardstock here was Basic Gray for the base and Smoky Slate for the background layer embossed with the Lucky Stars embossing folder. Whisper White was used for the Resist technique with clear embossing powder stamped in Versamark and heat set. The image was then cut with the Circle collection framelits and sponged with several inks including Smoky Slate, Wisteria wonder and Tip top Taupe. Wisteria, Basic Gray and Dazzling diamonds glimmer were added as banners. Rhinestones were added to the top of this card to balance it out. Here is the full pic below. How is your weekend going? I've had a wonderful day today. Class days are always fun and this Saturday was no exception. What a lovely bunch of gals I have in my classes. Its always great to catch up with them. Today's card features the Sleigh ride edgelits and is a sample card which I made for today's Christmas Card class. The cardstock is Night of Navy, Smoky Slate, Whisper White and Dazzling Diamonds glimmer paper. Here is a closeup. One of the gorgeous Wonderland embellishments adorns this card plus a few sequins. I love all the sparkle. Heres the full view of the card below. The greeting is from the Jingle all the way stamp set and is stamped with Night of Navy ink. Thanks so much for stopping by. I hope you all have a lovely weekend. Welcome to another challenge this week at the Paper Craft Crew. This one is a little different being a colour challenge this time around. Here are the details. I was a little stumped at first as to what to do with these colours. I am in full steam ahead Christmas card creating and these look like Autumn colours, Fall colours in the States, and we really don't have much of that in Sunny Queensland, Australia. I did however decide to go with nature. I'm using the three colours Daffodil Delight, Cajun Craze and Wild Wisabi. Here's a look at my card using the Sheltering Tree stamp set. I've used the Woodgrain embossing folder on the Cajun Craze base and the Lots of Labels framelits to cut out my image which I've stamped on a neutral base of Very Vanilla. Here's the full picture below. Thanks so much for calling in to view my card. For more inspiration please visit the Paper Craft Crew. We would love to see you enter the challenge this week. 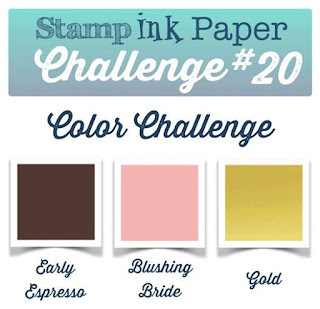 Welcome to another challenge with the Stamp Ink Paper. Its a challenge for Halloween and here are the details. Well you would be right in assuming I was not happy with this particular challenge because I am not a lover of Halloween at all. Its not celebrated widely in Australia and I have never ever made a Halloween card before. 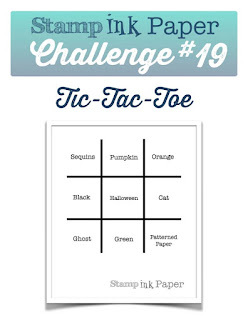 Not one to shy away from a challenge though I decided to use the diagonal line of the Tic Tac Toe challenge Sequins, Halloween and Patterned Paper. I've had this patterned paper in my stash for years thinking it would be great for boys birthday cards. These are not SU papers although the rest of my supplies are. I got to use my Elegant butterfly punch to create a black bat and the Boo comes from the stamp set Happy Scenes. I've used the Lots of Labels framelits to create the Label for them. The cardstock I've used is Basic Black and Very Vanilla. I was asked at very short notice the other week if I had a card suitable for a 50th Birthday. The card was for my husband's cousin and his Aunty has only just reminded his mother of the date. I went to look through my stash, as I already knew I had no 50th cards, but I wanted to see if I could add the 50th and update a card I had already made so it could be quickly popped in the post. This is the card I finished here. If you've followed my posts over this years this one may be familiar to you. I used the Baby wipe technique on it on glossy card for the front. The stamps shown here have all since been retired with the exception of the Papillon Potpourri butterflies. How has your weekend been? Mum's taxi has been pretty busy here. Lucky we have a pupil free day tomorrow, so its kinda like a long weekend, where I don't need to be anywhere in the morning at a specific time. Maybe even get to have a little sleep in. Wouldn't that be nice. a bauble to hang on the tree. Come and see. I've used a number of inks to sponge on this embossed image - Wisteria Wonder, Pool Party and Daffodil delight. Here's the full pic of the card below. I'm happy to have another card ready for Christmas. Have a great day. Today I'm sharing another 2 I've made with the same products as yesterday. While I had the stamps out, I stamped and heat embossed quite a few of this stamp so that I could ink it and add it to cards. Come and check out these ones. As the title suggests, I've used Night of Navy cardstock here and combined it with Whisper White card which I've embossed with the Lucky Stars embossing folder. I've also used framelits of Deco Labels and Circle Collection to cut and mat the stamped image. Night of Navy ribbon was added to the cards before mounting the stamped panels. Images for both cards were sponged with several inks including Night of Navy, Marina Mist, Pool Party and Daffodil Delight. I added one of the large Iced rhinestones to the ribbon on this card. Thanks so much for stopping by to view today's card. I hope you have a great weekend.